A little over a year ago, MLB Network hired Mike Gallardo, a former Cav Scout who served in Iraq with the 1st Cavalry Division, as a freelance member of its graphics department. Since joining MLB Network, he has become an integral member of the network’s graphics team and is on track to be made a full-time staff member at MLB Network this year. 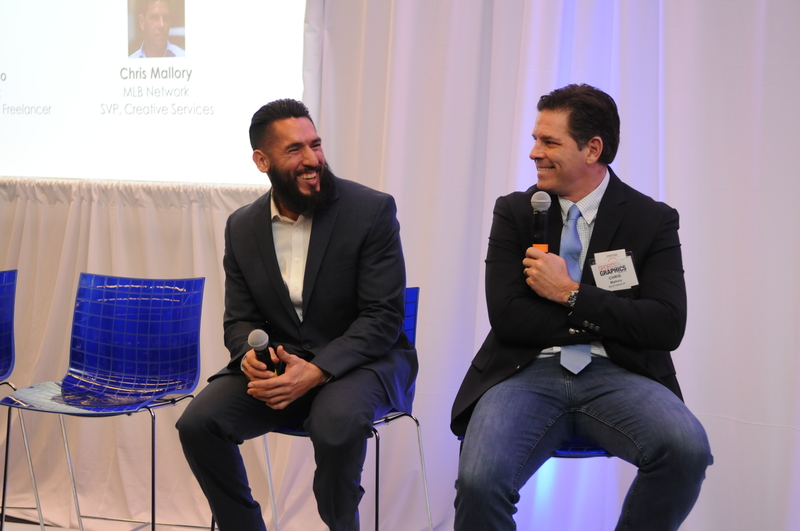 At SVG’s Sports Graphics Forum last month, Gallardo and MLB Network SVP, Creative Services, Chris Mallory shared this inspiring story in an effort to spread the word on the benefits of hiring military vets. In January 2007, Sergeant Gallardo severely wounded his Achilles tendon while carrying out a mission during his first tour of duty in Iraq. He returned home to Texas and received the Purple Heart for his service. “When I first came home, it was really hard for me. It’s a hard transition for anybody. I was depressed because I had doctors and therapists telling me, ‘You’re not going to be as active as you used to be. All you’re going to be able to do is walk,’” says Gallardo. After nine months of unsuccessfully trying to save his leg, Gallardo decided to have his leg amputated. “I started doing my own little physical therapy, first 200 meters at the track, then 400 meters, and on and on,” he explains. “Next thing I know, a year later, I was doing the Ironman [Triathlon competition]. So, when people were telling me that I couldn’t do something, I wanted to prove them wrong. In 2016, Gallardo heard about the MLB Network Veterans Apprenticeship Program through the Wounded Warrior softball team. MLB Network had been working to get veterans involved through its 11-month apprenticeship program. MLBN’s first apprentice, Dennis Deprisco, started three years ago and went on to win an Emmy for his work on MLB Tonight. He later went on to work on NFL Today on CBS and now works with ROOT Sports Rocky Mountain in Denver. When Gallardo arrived, he had no knowledge or experience in graphics creation or with Adobe Creative Cloud programs used by MLB Network’s graphics team, such as Illustrator, Photoshop, and AfterEffects. “He was about as green as you could possibly be,” says Mallory. “Mike, more than anyone else that I’ve ever known, has come back from that with an A+ effort. He just succeeds at everything he does. He’s a very driven human being. For more information on how you can become active in hiring veterans, get involved in SVG’s Veterans in Production (VIP) program today (contact SVG Co-Executive Director Ken Kerschbaumer at [email protected] for more info). For more information on MLB Network’s military-hiring experiences, contact Mallory ([email protected]).